As the 1970s are drawing to a close, the United States has recovered from the gas crisis of the early 70s. The federal government has implemented the CAFE (Corporate Average Fuel Economy) per gallon regulations. If companies fleet average fell below the mandated minimums they would be fined for each .1 mpg deviation multiplied by total sales. Failure to comply would be costly, however, the manufacturer could also earn credits that could be carried forward or backwards. Because of the CAFE is was apparent that aerodynamics would be an issue for fuel economy. Work on the '79 Mustang began in 1975 based on the evolving "Fox" compacts. Ford had several in-house teams working on the project using quarter scale clay models in the wind tunnel. The final design came from the team headed by Jack Telnack, and included Fritz Meyhew and Dave Rees. The turbocharged 2.3 "Lima" four cylinder made its debut with 131 net HP VS the 88 for the normally aspirated unit. The 302 V8 was also available with a low restriction exhaust. Performance in 1979 was considered to be fast with 0-60 in about 9 seconds. Ford had given hints that it wanted to become involved in competition again. There was even talk of an IMSA (International Motor Sports Association) Mustang with a turbo four. In September of 1980 Ford announced formation of Special Vehicle Operations (SVO) under Michael Kranefuss, who was the competition director for Ford Europe. The thought was to create a series of limited production performance cars promoted through motorsports. A Mustang IMSA concept was born powered by a highly modified turbo four. Klaus Ludwig, a former Porsche driver was selected to drive a turbo Mustang in selected 1981 IMSA events. Trans-Am driver Dennis Mecham and Kelly American Challenge driver Lyn St.James also received factory help. 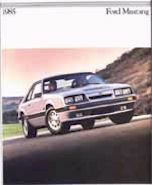 In late 1980 Ford released the McLaren Mustang. This Mustang was developed by Todd Gerstenberger and Harry Wykes. The McLaren resembled the IMSA concept but was designed to be converted to race duty. The McLaren also had the turbo four with a new variable boost control with a range of 5-11 PSl instead of a fixed 5 PSI. Ford never released an official horse power rating of the engine, but it was claimed to be 175 HP at 10lbs. of boost. The price tag of $25,000 limited the production to 250 including the prototype. I n 1982 a group of 30 engineers built two SVO prototypes from 1982 Mustangs with Jack Roush prepped motors to compete in the 24 hour road race for Grand Touring cars at Nelson Ledges, Ohio. Put to the test against the likes of the Camaro Z28, 280ZX Turbo, RX7-GSL, Porsche 944, and Toyota Supra...the team was out to prove a point. Interesting note: The race car used a 4-speed transmission, due to the fact that the 5-speed hadn't been put into production yet, they just grabbed something from 'off the shelf'. Notice the wheels? Remember, this photo was taken in '82. One SVO did finish the race, the whole Nelson Ledges story can be found on Jeff Fischer's Website, follow the links to the SVO Story. In 1983 the RPS Racing-Mustang SVO although battered, finished second to the Guldstrand Camaro at the Grand Touring Race at Nelson Ledges. From the beginning emphasis was placed on handling. The projected SVO run of 10,000 units per year created many problems for the engineering team. Take the shocks for example, the entire year's SVO production could be met in less than a week. This was deemed to be too expensive. Koni who produced the shocks for the Shelby Mustangs in years past was more than happy to oblige. TRW produced the rack with special valving that gives the SVO its characteristic "on center feel". Dyken produced the clutch, as Ford had no 4 cylinder clutch that would hold up to the power and torque of the new turbo 2.3. The SVO was to have 4 wheel disc brakes for competition high speed stops and fade resistance. The brake system was adapted form the Lincoln to the SVO. The reason for the large rear calipers and rotors? There are federal safety standards on brakes. One test is, get the brakes very hot, smoking hot, park the car on a 17 degree hill and set the emergency brake to the first click that will hold the car in place. The car must remain in place 30 minutes, if not, it fails the test. The SVO team wanted a 17 inch tire but felt the cost would be too great, so they settled for a 16 inch tire. GM was using Goodyear "Gatorbacks" on the Corvette. However, the Gatorback was a proprietary GM pattern. Thus the NCT tire that was designed for the Porsche 928 was used until Goodyear designed the SVO its own Gatorback. The Dearborn Assembly Plant had no machinery to mount and balance 16 inch wheels. Automatic machinery was developed to mount and balance the new 16" tires. This same machinery is still used today in the Dearborn Facility for 16 and 17 inch tires. The hood also faced many hurdles in the development stages. It seems that Ford has a test, in which a hood must be dropped from full open position, stop on the bumpers without chipping the paint. This test failed several times before the hood was reinforced and additional bumpers were added. 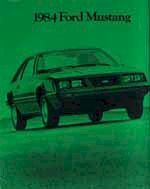 In late 1983 enter the Mustang SVO. The SVO received rear disk brakes and larger front disc brakes. Stiffer bushings and spring rates combined with Koni adjustable struts, and shocks (preset by Koni to the City Ride), spindles and control arms, a larger front sway bar and rear sway bar. To round out this remarkably handling Mustang, Goodyear European NCT radials were mounted on unique 16 x 7 inch wheels. Later the SVO would receive Goodyear Eagle 225 50 Gatorbacks. The power steering was a high effort 20:1 ratio. The turbo four had an air to air intercooler with an adjustable boost-control system that allowed the AiReasearch T03 housing with an A/R of .63 to reach an induction pressure of 14PSI, (at the time, this was thought to be the highest of any production turbo motor). The 2.3 was controlled by the new EEC IV processor and was rated at 175 BHP. A fuel switch was added to calibrate the engine for the type of fuel being used. The transmission was a Borg Warner T-5 transmission with Hurst shifter complete with leather covered knob and shifter boot wearing the Hurst logo. The transmission was coupled to a 7.5 inch Traction-Loc 3:45:1 limited slip rear. Wheel hop was controlled by traction bars (slapper bars in the SVO community), all SVOs manufactured after December of 1983 received Koni quad shocks. There were many unique interior items that were unique to the SVO such as the leather wrapped steering wheel with the SVO logo on the horn pad, suede effect dash panels, unique cloth material for door panels, left footrest, automatic transmission brake pedal to facilitate heel to toe shifting, 140 mph speedometer, although there were no numbers past 85, and an 18 PSI boost gauge. Charcoal was the only interior color available. The articulated seats manufactured by Lear /Siglar featured oversized side bolsters with pump up lumbar supports and utilized the same material as the door panels. The body was not to be left out, as there were many unique exterior features such as, fender flares also know as spats, sail panels behind the quarter glass, tail lights that would later be used on the 93 Cobra, wrap around front fascia panel, single front headlamps, narrow body side moldings and the two most obvious SVO trademarks, the bi-wing rear spoiler and the hood with the functional hood scoop to force air through the intercooler. With the exception of early 84 production models where items could have been ordered "deleted". The SVO came standard with such features such as, power windows, power door locks, air conditioning, rear window defroster, and fog lamps. The only optional items available were, leather interior and flip up glass sunroof. In 1984, 4508 SVOs were produced and were available in four colors, Black (1C), Dark Charcoal Metallic (9W) (1984 was the only year for this color), Silver Metallic (1E) and Medium Canyon Red Metallic (2A). The MSRP (Manufacturer's Suggested Retail Price) was $15,970, $6,000.00 more than the Mustang GT. The '85 SVO was a carryover from the '84 with a few exceptions. The Traction-Loc rear ratio was change to 3.73:1, transmission ratios were also changed. Suspension changes were, shocks and struts preset by Koni to the firmer Cross Country setting, rear spring rate was increased, rack and pinion ratio was changed to 15:1. The Premium Sound System no longer had a separate amplifier switch and exterior trim color was changed from black to charcoal gray. In 1985, 1515 SVOs were produced and were available in seven colors, Black (1C), Silver Metallic (1E), Medium Canyon Red Metallic (2A), Jalepeno Red (2R), Dark Sage (4E), Oxford White (9L) and Medium Grey Metallic (1D). The 41C "Comp Prep" Option which deleted air conditioning, power windows and radio was the only change to the '84 options. All SVOs built after April of 1985 were designated as mid-year. There were many changes to the engine and a horsepower increase was a result. Modifications to the engine consisted of, boost pressure was increased to15 PSI, different intake manifold, turbo was water cooled and the turbine was changed to a .48 for quicker spool up, injectors were increased from 30lbs to 35lbs per hour, updated EEC IV processor, dual mufflers and tail pipes rounded out the new modifications. The engine modifications increased the output to 205 HP at 5000 RPM with 240 foot pounds of torque at 3200 RPM. The only changes to the body consisted of new flush Aero Style headlamps. 439 85� SVOs were produced making this the rarest of the breed and the most sought after. In 1986 3382 SVOs were built bringing the three year total to 9844 units. There were no changes to the '86 SVO except the HP rating was changed to from 205HP to 200HP due to the reality of lower octane fuel. The federal mandated 3rd brake light was added to the lower spoiler. Chrome SVO badges were added to the front fenders. Dark Shadow Blue (7B) was added, Med. Charcoal Metallic (1B) was changed to Medium Grey Metallic (1D). This would be the last year that the SVO would be produced. There was talk at Ford about '86 being the last year of the Mustang. The reasoning was, the increasing popularity of the Mazda built Probe and better EPA numbers would help Ford meet their CAFE requirements. The SVO team was informed that the Mustang would be dropped at the end of '86. With the SVO team notified of the demise of the Mustang, work was begun on a new SVO T Bird. While the work progressed, the UAW approached Ford and pointed out, If the Mustang was replaced by the off shore produced Probe, many Dearborn workers would be without jobs. 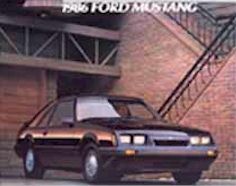 Ford agreed and signed a contract with the UAW to produce the Mustang until 1993. Though the SVO only had a three year production run, future Mustangs and the new 87 Turbo Coupe would benefit from the SVO. It has been said the the SVO was the best handling Mustang ever produced. In 1993 the Mustang Cobra would receive rear disc brakes and even shared the same tail light lenses as the SVO. The Turbo Coupe received an improved Intercooler and rear disc brakes. Although the Turbo Coupe was a different car, in many ways the engine and drive train were similar. We may never know what the 87 SVO would have been had Ford not killed the project, but there are rumors it was to have a Dual Over Head Cam 16 Valve head that would produce 275 horse power. It probably would have had the serpentine belt system and the 8.8 rear. Who knows? Maybe one day we will find the specifications for the planned 87 SVO.